Seating plans don’t just tell guests where to sit. They also mark the significance and formality of your day. Tie your wedding day stationery together with a matching seating plan or seating chart for your reception. Scroll down to explore our exclusive collection of pre-designed seating plans, available printed on canvas, card or paper. Seating plans can be couriered throughout New Zealand and internationally. To find out more about a design, or to order, simply click on the corresponding image. What’s included with Be My Guest Seating Plans? When should I order my seating plan for my wedding? As wedding stationery a time sensitive item, it’s important to allow as much time as possible. For card and photo paper prints, allow two weeks for design, printing and delivery. For canvas seating plans, allow up to three weeks, as the canvas assembly process takes a little longer. Allowing plenty of time ensures you receive your seating plan and other stationery pieces well before your set-up day (and you can relax and know you’ve got everything you need for your wedding day). Faster turnaround times are possible, please get in touch and advise your wedding date and preferred printing method to check. Urgency fees apply and the above timeframes exclude weekends and public holidays, so it pays to be organised. There are a number of options available for printing your seating chart, but the most popular is to receive your plan mounted onto canvas and stretched on a frame. This makes them suitable to place on an easel or hang on the wall. In the image below you can see a close up of the paper and mounting. This type of seating plan takes the longest to be printed. You can also elect to have your seating plan printed onto high quality matt photo paper and delivered rolled into a cardboard tube. These seating plans are suitable to frame, and are not stiff enough to sit on their own. We have the flexibility to print any size. As well as the large format signs as described above, Be My Guest can also design and print seating plans with the tables separated out onto smaller pieces of card, as in the above image. If you’ve got access to a printer, and/or you want to save on shipping costs and time, the electronic option is a great way to go. You’ll receive your high resolution PDF file quickly (within 48 hours during the working week) and can take your file to a local print shop or print at work. This is the option we recommend for people that are wanting a seating plan last minute – as none of us have to worry about the couriers being on time! How much are seating plans? Please browse through the Seating Plans category in the Be My Guest shop for an indication of pricing – it depends on the format (canvas, paper or electronic) and the size you select. What size seating plan should I use for my wedding? Our answer is usually “whatever is going to work in the space that you have”. Here’s an example for you (since the people usually worried about what size they should pick, are having big weddings). The seating plan above has over 210 guests and 21 tables listed. Vanessa ordered an electronic version off me, so that she could get it printed locally, since she was in a bit of a hurry. I originally designed an A0 size as was requested (84cm x 118cm – over a meter high!). However when it came to be printed, she realised that this size was going to be much bigger than she’d envisaged for her wedding and the space she had available. The great thing is, it didn’t matter! All she needed to do, was ask their local printer to scale the electronic file to print at the smaller size. 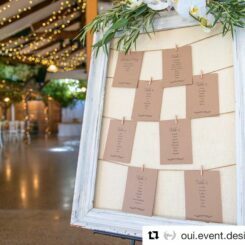 The size Vanessa and Tevita ended up printing their seating plan was A2, which is a nice size for a frame on top of a table or pinned nicely to the wall (42cm x 59cm). So the main takeaway from this is: it doesn’t really matter how big your wedding is – the size of your seating plan can be whatever will work for you. As we don’t adhere to a “template” as such, we can adjust and tweak the tables to hold as many or as little guests as possible (and even accommodate guests with reaaaaaaallllly long names like Tevita & Vanessa had). My usual recommendations for size: A2 is perfect when your seating plan is going onto a tabletop easel, and A1 works perfectly if you’re using a floor standing easel. 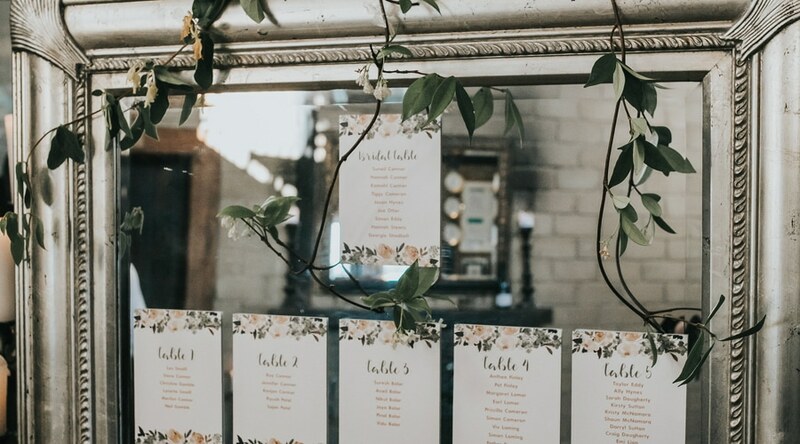 A0 is fine in big spaces… A3 can work, but you wouldn’t want to be having a big guest list (as the font would get too small to be legible by guests arriving and crowding around the plan). Figuring out who sits where can be really hard work! Southern Bride has some helpful advice on how you can sort out your wedding seating plan.